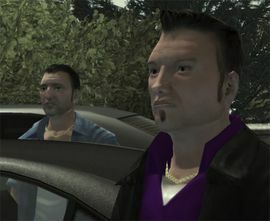 Peter Marchetti (left) alongside Marco Bonnaro during the beginning of "Pegorino's Pride" in GTA IV. Peter Marchetti, also known as Big Pete, is one of James Pegorino's bodyguards during the mission Pegorino's Pride where Pegorino meets with the Pavano Family. He is killed, alongside his friend Marco Bonnaro, by Pavano hitmen. It is almost impossible to save Pete during the mission. It is possible, but the player has to focus on him or Marco only. Regardless of whether the player manages to save them, the game will say they died. This page was last modified on 26 October 2013, at 16:33.